What if you knew the exact key elements your content needs to have in order to rank in Google’s top results? What if I told you that there is a framework that allows anyone willing to invest in content to have high ranking pages in matters of weeks? Do you know how the content of your website actually impacts your Google rankings? And this is because if you torture data long enough, it will confess. And yes, content does influence rankings but here’s why and how. When you actually see real numbers that show to what extent content influences rankings, it’s totally different. And if you’re wondering what numbers am I talking about, check the graph below. 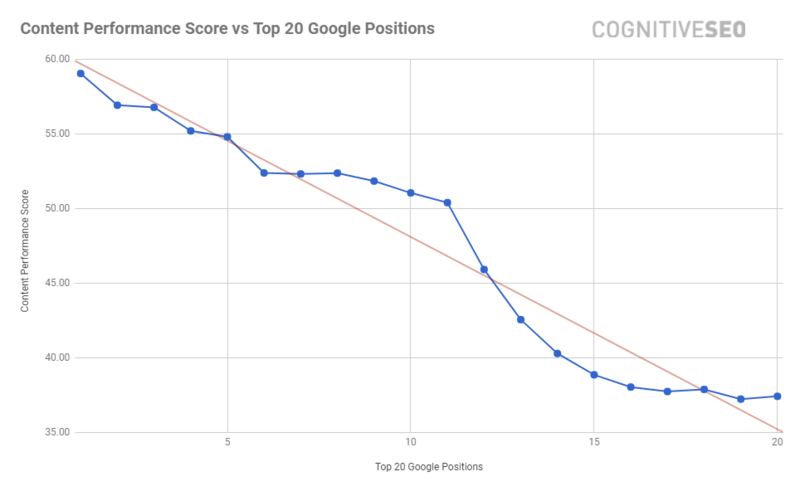 After compiling and analyzing all the ranking content for the top positions in Google, for around 40,000 keywords, it seems to be a very strong correlation between content performance and rankings. The higher the content performance, the higher the rankings. The key within this affirmation is “content performance”. By now you might be wondering: What is this content performance score? How is it measured? And if it does impact rankings, how can it be improved? Keep on reading and you’ll get your answers. As we at cognitiveSEO like to be problem solvers, we tried and failed, then tried some more, and worked a lot until we found a way to measure how well optimized a piece of content is. And this is how The Content Performance Metric was born. The metric shows you how well a page is optimized from a content point of view, on a scale from 0 to 100. The higher the score, the better optimized the content is. And not only this: the same metric gives you info on the reasons why a piece of content is performing well or not. The Content Performance metric is an indicator entirely developed by the cognitiveSEO team, everything from soup to nuts. A lot of Google reverse engineering was involved in this, combining algorithms and concepts such as semantic search, LSI (Latent Semantic Indexing), TF*IDF or topical authority, just to mention a few. 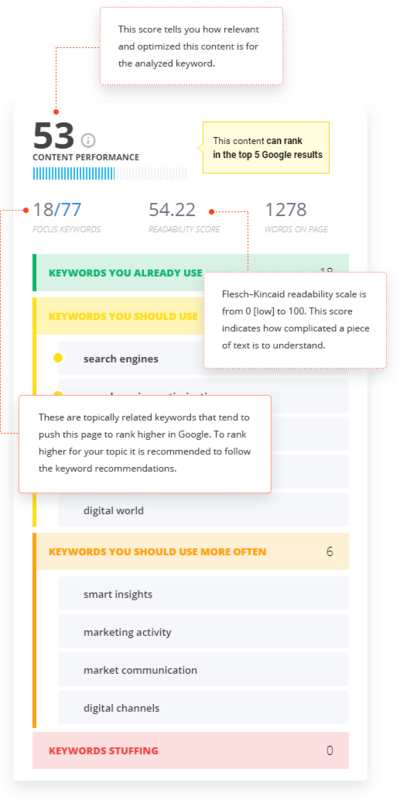 You can easily get the content performance score for every piece of content you might be interested in; but along with it you get even more: the exact keywords that one should use in their content to improve that score. We start by analyzing the top rankings results from Google, having the content as a focus point. After this, we apply some really advanced algorithms in order to identify the semantics, topics, and keywords used on those pages. We do not take in consideration HTML tags influence (h1/h2, etc.). We only look at how well written and relevant the content is, trying to identify the exact factors that boosted those pieces of content on the top of the rankings. Seeing the high correlation between the content performance score and the rankings, wouldn’t it be great if there was a framework that helped you to calculate and improve your content performance score? But, when it comes to the framework you will have to attend my UnGagged session to find out everything! Can hardly wait to see you in London in April! 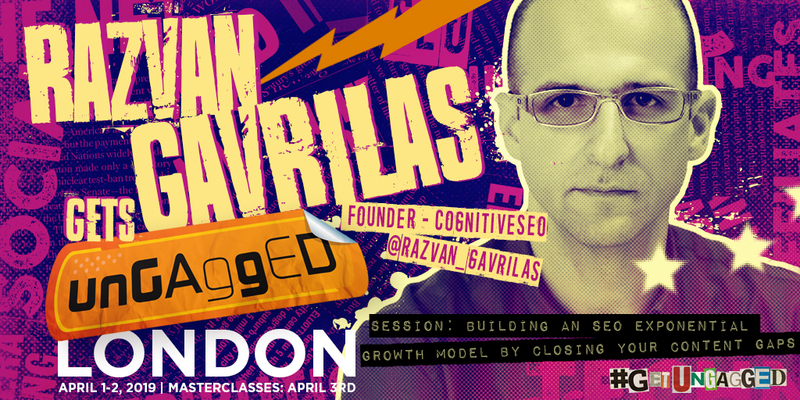 Founder of cognitiveSEO and Brandmentions, with 20+ years of SEO and digital marketing experience. Razvan is always happy to share and win knowledge within conferences and meetings.